Kristina Liefke earned an M.A. in philosophy and English linguistics from Christiania Albertina University at Kiel (Germany) in 2009, and obtained a PhD in philosophy from Tilburg University (the Netherlands) in 2014. Since 2014, Kristina has been a postdoctoral fellow at the MCMP at LMU Munich. 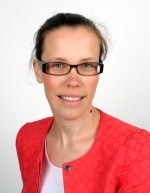 Since 2015, she is PI of the MCMP-based project “Unity and Unification in Intensional Semantics”, which is funded by the German Research Foundation, DFG. Kristina's research lies in the intersection of formal natural language semantics, logic, and the philosophy of language. Her dissertation (Tilburg University, 2014) investigates a topic in the foundations of formal semantics for natural language. Her current work focuses on type-logical semantics, (hyper-)intensionality, attitude reports, two-dimensional semantics, and information-dependence. She has recently developed an interest in the 'effectiveness' of natural language interpretations and in situated reasoning.